A "hard Brexit" would be the "biggest disaster" to have hit the UK's universities for many years, a university head told MPs. Alistair Fitt, vice chancellor of Oxford Brookes, was giving evidence to the Education Select Committee, holding a special away-day session at the University of Oxford. With the elegant panorama of Pembroke College behind them, the MPs wanted to find out what would be the impact of Brexit on the UK's university sector. You would be hard-pressed to find any sector in the country more opposed to Brexit than higher education. So it was probably no surprise that the MPs heard an unrelenting message that leaving the EU was a grim prospect for higher education and research. University organisations, which usually put much effort and ingenuity into not really being for or against anything in public, took to open campaigning for a Remain vote. Universities, bastions of liberal thinking, intensely international in their outlook and staffing, seemed culturally allergic to Brexit. And the referendum result hangs over them like they've fought and lost a civil war. Professor Catherine Barnard from the University of Cambridge told MPs that her own university had seen a 14% drop in applications this year from EU students. The university had asked why potential students had turned down a chance to study at Cambridge - and she said among the reasons were fears over an "anti-immigrant sentiment" and uncertainty over the future of the UK's involvement in international research. Prof Barnard warned that talented mathematicians at Cambridge from countries such as Hungary, Poland and Romania would take their sought-after skills elsewhere. The committee of MPs heard warnings that in some elite research institutions in the UK, vital to the national infrastructure, as many as two thirds of the staff were EU nationals from outside the UK. Would they hang around and see if they were still wanted after Brexit? Or would research rivals in Germany or China snap them up to the detriment of the UK economy? Showing how seriously they take this, Oxford University has appointed its own head of Brexit strategy. So you could say that at least Brexit has already created one extra job. But this new postholder, Professor Alistair Buchan, saw leaving the EU as threatening to relegate the UK's universities behind their global competition. 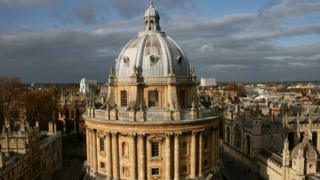 Oxford has been ranked as the world's top university, but Prof Buchan said that in 1970s the UK's universities did not have that top status. This had been built through the EU years and growing networks of international partnerships. He described Brexit for universities as the "Manchester United problem". Why would any football team with international ambitions deliberately want to restrict its access both to better talent and to bigger markets? There were warnings about the financial impact of losing European research funding. The UK's universities are among the biggest winners from Horizon 2020 research network, bringing more than £2bn into the higher education sector. This is no small-bière, with some individual universities worrying about the loss of hundreds of millions. If the UK is to stay ahead in research, Dr Anne Corbett of the LSE said the UK government had to be ready for some "serious funding". Professor Stephanie Haywood, president of the Engineering Professors' Council, warned that losing access to EU students would make skills shortages in engineering even worse. But could there be an upside in higher tuition fees? If EU students are designated as overseas students after Brexit, UK universities could charge them much higher fees. But such a tuition fee windfall depends on those students not staying at home or going somewhere else. Prof Barnard raised the example of those talented eastern European mathematicians. Would they really be able to pay £17,000 or so a year? Or would it mean that universities in the UK would have pay for scholarships rather than see them go elsewhere? Committee chairman Neil Carmichael pushed his witnesses for more evidence and facts. But what came back most often was even more questions. What's going to happen to the EU staff in UK universities? What will be the visa system for students? What will happen to the intricate networks of European research? How much will the UK government be willing to cover for any lost income? And of course, so far, these are unknowns being piled up on unknowables. But as another European refugee scientist, Albert Einstein, once said: "If we knew what we were doing, it wouldn't be called research."